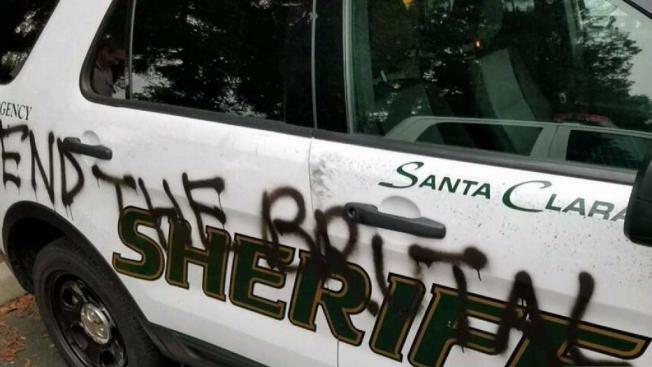 Santa Clara County Sheriff’s deputies were the target of vandals Tuesday night in Cupertino, according to sheriff's officials. Three sheriff's vehicles at the West Valley Substation were tagged with graffiti, some political in nature and some downright vulgar. Most concerning was one message that mentioned a deputy by name, sheriff's officials said. Part of the investigation is to review that deputy's cases. "We will exhaust all leads, whether it's looking back through the officer's cases or anyone who has made any spontaneous comments on social media," sheriff's spokesman Sgt. Reginald Cooks said. The other messages contained in the graffiti were "end the brutality" and the initials B-L-M, an apparent reference to the Black Lives Matter movement. The vehicles were parked at the substation, an office building with an unsecured lot. Community organizer Ross Pusey, a supporter of the Black Lives Matter movement, says because someone sprayed the initials B-L-M, it can't be assumed it's connected to the group. "Anybody could have been writing that on there," Pusey said. "Until somebody steps up and says that it is (connected), we have no idea." Investigators don't have a suspect description, so they're asking for the public's help. "We're asking the public if they have any information, if they've seen things on social media or anybody posting anything, to contact the sheriff's office," Cooks said. There are no surveillance cameras in the lot that is open to the public, and there are no plans to change the security of the lot, sheriff's officials said.